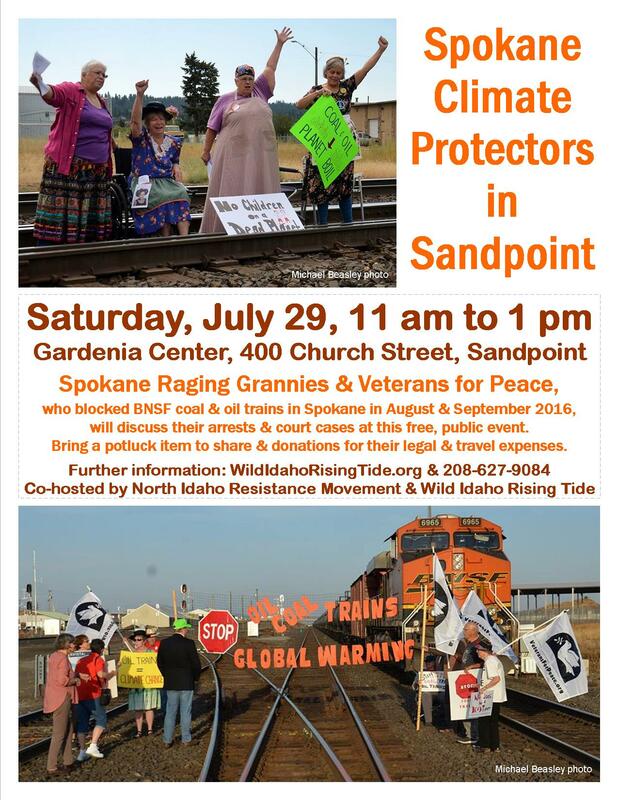 On Saturday, July 29, from 11 am to 1 pm, North Idaho Resistance Movement (NIRM) and Wild Idaho Rising Tide (WIRT) will gratefully co-host some of the six brave Raging Grannies and Veterans for Peace who blocked coal and oil trains in Spokane, Washington, twice in 2016 . Their talk in the Rose Room of the Gardenia Center, 400 Church Street in Sandpoint, Idaho, will discuss their arrests and court cases, and will include a question-and-answer session followed by a potluck. The free, public event welcomes food items to share and donations for the legal and travel expenses of these Spokane Climate Protectors, who are also raising funds online through GoFundMe . For further event information and current media and grassroots coverage of this issue, see the following, expanded event announcement, and contact Sparrow Ivy of NIRM at 208-627-9084. A June 26, WIRT alert, which appeared in the Earth First! Newswire, provides earlier issue descriptions [3, 4]. Raging Grannies Margie Heller, Nancy Nelson, and Deena Romoff and Veterans for Peace Maeve Aeolus, Rusty Nelson, and George Taylor stopped ever-increasing, dusty coal and explosive oil trains at two demonstrations on Burlington Northern Santa Fe Railway (BNSF) tracks, near Trent and Napa streets in East Spokane, in late August and September 2016. Now known as the Spokane Climate Protectors, these six visionaries have contributed immensely to the struggle for clean air and water and the health of the planet, through their direct actions and state and federal court cases. Since June 26, 2017, two hearings and presentations, expert testimony, and a federal court decision denying citizen rights to a livable climate and local self-governance have drastically altered the legal situation of these fossil fuel train blockaders. Spokane attorneys Eric Christianson and Rachael Osborn anticipate advocating the necessity defense of Reverend George Taylor, the only remaining defendant going to trial, at an August 21, Spokane County District Court hearing. The Wednesday, July 26, Climate Justice Forum radio program, produced by regional, climate activist collective WIRT, will feature a 40-minute, recorded, telephone conversation with Lutheran pastor, Veteran for Peace, and Spokane Climate Protector George Taylor. George will talk about the context and motivations of Spokane fossil fuel train blockades and associated, lawsuit hearings upholding the necessity defense and Constitutional rights to a healthy climate and community self-government. Broadcast for five and a half years on progressive, volunteer, community station KRFP Radio Free Moscow every Wednesday between 1:30 and 3 pm Pacific time, on-air at 90.3 FM and online via livestream, the show covers news and interviews about continent-wide, community opposition to extreme energy projects, thanks to the generous, anonymous listener who adopted program host Helen Yost as her KRFP DJ . Videographers and news reporters for two Spokane television stations and dozens of activists attended the June 26, Spokane County court hearing of the Spokane Climate Protectors before Judge Debra Hayes [6-9]. These cohorts broke laws about trespassing on railroad tracks and stopping and delaying trains, to protect their grandchildren, communities, and the global environment threatened by fossil fuels and subsequent climate change. Before the court had decided whether to allow the defendants’ necessity defense, the three-hour, pre-trial motion hearing included expert testimony on climate change and civil resistance from two key witnesses. For an hour starting at about 2:45 pm on that Monday afternoon, Rachel Osborn questioned climate scientist and Nobel laureate Steven Running, of NASA, the Intergovernmental Panel on Climate Change, and the University of Montana, who explained the dynamics of and strong scientific consensus on growing carbon emissions, their fossil fuel sources, and their impacts on climate change. Along with 15 documents submitted to the court, Dr. Running’s candid explanations provided clear evidence that global temperatures and accompanying, detrimental effects are rising, due primarily to four industries: coal, oil, gas, and cement. Portland State University professor and civil resistance scholar and author Thomas Hastings added two more admitted documents and another hour of assertions, describing how non-violent, direct actions have historically, most effectively resolved long-term, social and environmental problems, and convinced governments and other institutions to change policies, more rapidly than conventional methods and twice as often as violent resistance. Determined to proceed with this court case and trial, 77-year-old, Lutheran minister George Taylor did not take the stand at the June 26 hearing that he considers another form of protest. But he will describe his previous climate activism and train blockade reasons when lawyers motion for his necessity defense at the next, August 21 hearing. Three of the Spokane Climate Protectors accepted plea deal contracts with the state (stipulated orders of continuance, SOCs), before the hearing concluded at 5 pm. The SOCs borne by Maeve Aeolus, Margie Heller, and Deena Romoff impose minor fines, no activism-related misdemeanors for one and a half years, and no contact with BNSF. Two blockaders, Nancy and Rusty Nelson, could not participate in the hearing, due to a previous scheduling conflict. Like the others, they will agree in early August to pay a fine and not block railroad tracks or contact BNSF for 18 months. The state will drop their charges of second degree trespassing and blocking a transportation route, if they comply. Amid a powerful lightning, thunder, and rain storm and brightly colorful sunset on Monday evening, June 26, WIRT recorded, photographed, and participated in the Witnesses for the Climate talk, hosted by Direct Action Spokane at the Community Building in Spokane, Washington [10-12]. The educational forum presented by climate change and civil disobedience experts, who testified earlier in the day at a Spokane County court hearing, on behalf of the necessity defense of the Spokane Climate Protectors, involved an audience of about 60 mostly older activists. University of Montana professor of global ecology, NASA Earth Science Subcommittee chair, and internationally recognized, climate change expert Steve Running discussed fossil fuels-driven increases in greenhouse gases and subsequent climate chaos. Portland State University professor, researcher, and long-time activist Tom Hastings described nonviolent, direct action and conflict resolution throughout history. He recommended the 2011 book Why Civil Resistance Works, by Erica Chenoweth and Maria Stephan, and Dr. Chenoweth’s TED and other talks, to better understand peaceful protests [13, 14]. In a more recent and illuminating, 12-minute presentation, Erica states that, “Civil resistance is now the primary way that people are challenging entrenched power from below” (6:28), most successfully without violent flanks that expand a “diversity of tactics” . Activists and organizers “need to promote greater access to information, skills, and collective wisdom about how non-violent campaigns succeed on their own terms” (9:58). In January 2017, the Community Environmental Legal Defense Fund (CELDF) filed a case on behalf of six Spokane area residents, including physician Dr. Gunnar Holmquist and the Spokane Climate Protectors, challenging the federal government for failing to honor citizen rights to a healthy climate and for obstructing rights to the local self-government necessary to securing a livable climate [16-18]. On the July 11 evening before a motion hearing of the Holmquist v. United States lawsuit, the plaintiffs’ attorney, Lindsey Schromen-Wawrin of CELDF, one of the first Spokane, tar sands megaload protesters while a Gonzaga law student, gave a presentation about the case and actions expected of the federal government and court. Most of the Spokane Climate Protectors participated in the discussion at the free, public event called Making the Legal Argument for Our Right to a Livable Climate, held in the Community Building in Spokane. On Wednesday morning, July 12, in the Thomas S. Foley federal courthouse in downtown Spokane, U.S. District Court Chief Judge Thomas Rice presided over a hearing to determine if the court would accept the lawsuit, after the federal government filed a motion to dismiss it [19-21]. About 30 supporters arrived early to show government-issued photo identification, to access and pack the courtroom gallery of this Obama administration appointee. Spokane climate activists hoped to overturn a 1995 federal law, the Interstate Commerce Commission Termination Act (ICCTA) that may preempt local laws from banning coal and oil trains as violations of Constitutional rights to a healthy climate. Oral arguments by the Spokane plaintiffs’ legal representative cited a ruling by Oregon U.S. District Court Chief Judge Ann Aiken in the landmark, Juliana v. United States, climate lawsuit brought by Our Children’s Trust, whose young, mentoring, plaintiff ambassadors will visit Sandpoint for an enthusiastic, August 12 talk on sustainability and replacing carbon in the ground . Fossil fuels and manufacturing trade groups have unsuccessfully sought appellate review of Judge Aiken’s decision, before the case could even go to trial. Ironically, in the wake of U.S. withdrawal from the Paris Climate Accord, and after decades without meaningful, responsible, government actions to avert climate change, skeptical Judge Rice repeatedly agreed with the Washington D.C. lawyer for the U.S. Department of Justice, that federal laws do not preclude citizens from seeking relief for climate concerns through state and national elections and legislative and executive avenues. But recent studies have concluded that ordinary people cannot influence how federal representatives decide policy. Judge Rice did not immediately rule from the bench, but said that he would issue a written order on lawsuit acceptance or dismissal within days. By July 15, CELDF distributed a media release declaring that the federal judge granted the government defendant motion to dismiss the climate rights case on procedural grounds of standing, ignoring basic human rights to a healthy, stable climate and local community self-governance, not to mention the urgency of reducing the fossil fuel-generated, greenhouse gas emissions causing climate change . Although the plaintiffs may appeal this decision through the Ninth Circuit Court of Appeals within 60 days, the ruling invites another Spokane, climate rights, ballot initiative banning coal and oil trains to move forward and face possible legal challenges. Non-violent, civil resistance not only eventually, successfully banishes violent oppressors, like the fossil fuel industry and its corporate and government facilitators, it encourages broader involvement, more benevolent and creative behavior, and the ultimate emergence of more peaceful and just societies. Targetless, passive events, such as movies, presentations, and climate marches, are not enough to shift power to the people from ever-present, repressive, climate change perpetrators. But ongoing, grassroots, fossil fuel resistance tactics, like those practiced by Spokane and WIRT activists outside the inherently corrupt, American, political system, can catalyze opportunities for and transitions to resilient communities and healthier energy economies. As through the visits and talks by Olympia Stand comrades, tar sands pipeline valve turners, Standing Rock warriors, and other allies, we trust that bringing train- blockading Raging Grannies and Veterans for Peace to Sandpoint will closely connect local activists with assertive models of valiant, effective actions that they can emulate. 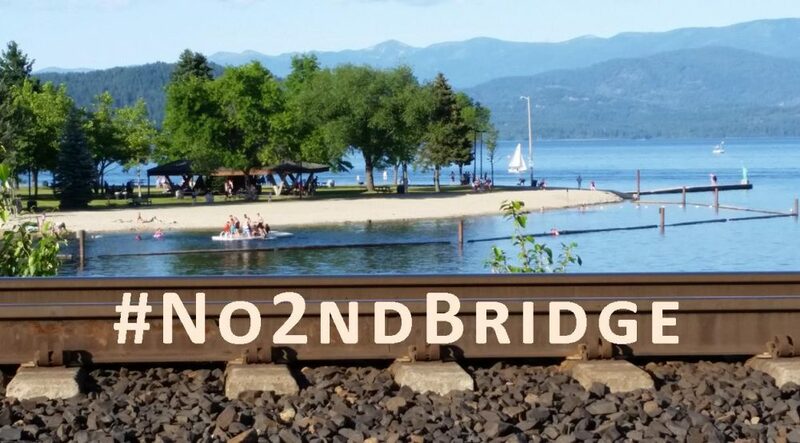 Spokane Train Blockaders Will Use Necessity Defense, June 26, 2017 Earth First Newswire!